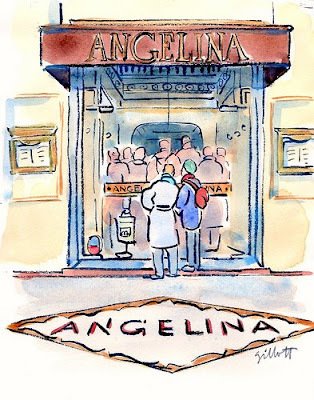 Angelina Paris1,original art, 9" x 11"
Have you waited on line to get into Angelina's? 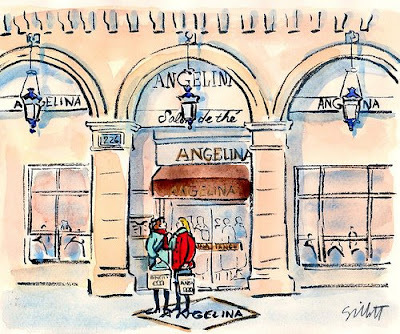 Angelina Paris2, original art, 9" x 11"
Parisiens think it's the most normal thing in the world to stand on line for hours for a cookie! 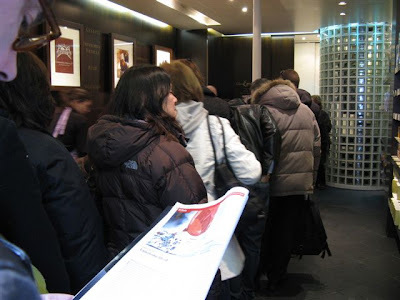 Here are some insane Parisiens waiting in line out in the bitter cold at La Maison du Chocolat to purchase their Easter chocolates. 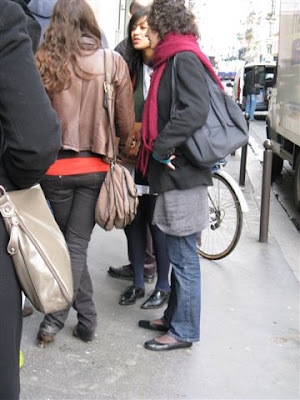 Parisiens are that intent on their objective. 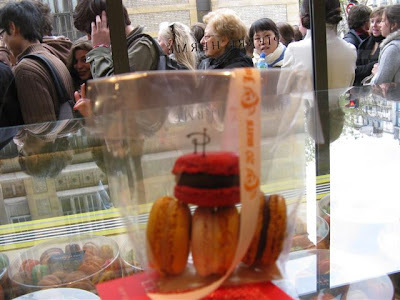 Particularly if it's FREE macarons on Mac Day at Pierre Herme! Ah Ha! The much awaited prize!!! And well worth the wait too. 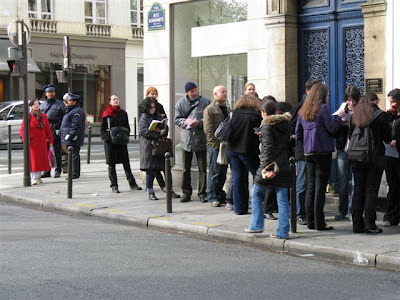 Even Paris hounds line up without much complaining. They are quite well behaved in fact, but then they are used to it. Are you a native New Yorker? No where else have I heard the expression "on line". This series of storefronts is a goldmine. Each new work makes the series greater and greater. So enjoyable linework and colour. I must indulge myself. This afternoon, we will find Macarons! I absolutely *L*O*V*E* your storefront watercolors!!!!!!!!!!!!!!!! I have always loved storefronts in postcards, etc, but you don't find them very often and I've never seen any like yours. So I will dream of getting some one day. You can definitely do a book or a series of postcards! So yummy. Oooh, I love your facades! More, please! 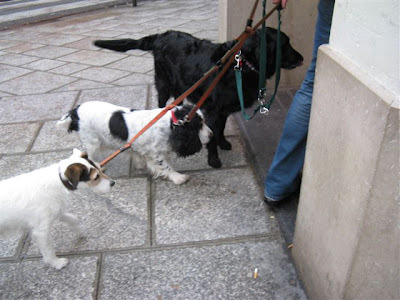 The dogs are the best dressed in Paris! on se suit c'est drôle!!! Speaking of Le Metro de Paris (second photo caption), have you done any paintings of the spectacular Guimard entrances? I love your artwork! 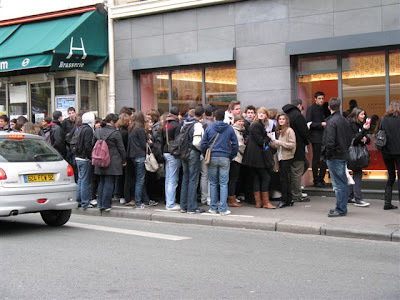 Anyhoo- I did not understand paris lines and once, (only once), walked straight into a butcher shop passed everyone- then realised my mistake- I was SO ashamed! then the guy said You are Aussie? Yes?? I was even more ashamed! 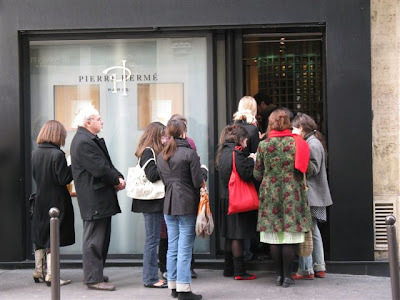 I have to admit, I felt a little cheated when I didn't have to stand in line at Pierre Herme when I was in Paris in November. I walked right in and didn't have some extra time to make my decisions. 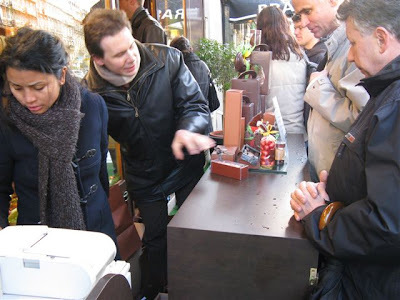 Fortunately, the employees were very nice (even to this non-French speaking American) and even gave us free macarons for the kids. Oh, I am scared now! We're heading to Paris in about 7 weeks, I am not good at standing and waiting. My 3 year old daughter is worse! I adore your watercolours, when I come home from our trip I hope to buy one as a momento of our trip, which is certain to be memorable! These storefront sketches are lovely. They would make wonderful book covers! Your timing is great for storefronts, because so many of the charming ones disappear too often...and continue to disappear. Of course a lot of people are opening up new storefronts that look old, which is great. But not enough in my opinion. I look forward to all your new work, like so many others. 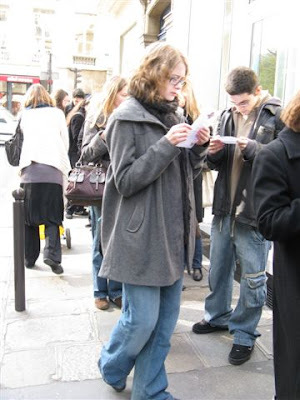 Americans stand in line, the British queue and the French queue and do stuff whilst they wait. I want to get on a Paris Line!!! 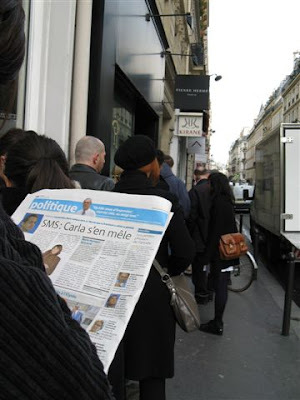 I would happily get on any Paris Line at anytime just to be in Paris...a great way to see the current trends too.